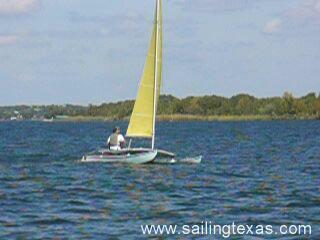 Tacking a Hobie 14 or 16 is not difficult, IF you know how it's done. The hulls on these Hobies are flat on the outside but convex on the inside, so each hull has a slight tendency to turn outward. Consider tacking on starboard tack, as shown in this video. If the starboard hull is deeper in the water than the port hull, the boat will have a tendency to turn to starboard because of this inside curve. Perhaps even more important, if one hull is deeper in the water it will have more drag than the other, and the higher hull will more easily pass the deeper one. As you watch Mike tack, you will notice that he stays on the starboard pontoon until the sail fills on the new tack, only then moving to the port side of the boat. By keeping the starboard hull deep in the water the Hobie tacks quite well. Another little help, which you can see if you watch for it, Mike pulls the mainsail all the way in as the boat approaches head to wind to keep the power on as long as possible. Many recommend that you then ease the mainsail when head to wind so the boat can finish the tack without resistance, THEN move to the new windward side, power the sail and away you go. You may have to click the play button twice to see this one.